The automatic classification of data, its indexing, and its evaluation are at the heart of new communication environments. What lies beneath is not just a drive to organize the world's information, but also to classify human relations: from the management of the modern workplace and consumers in mass societies, to the bio-political management of the network society. Sociometric algorithms quantify all areas of life in order to mathematically model and predict human behavior. In today's booming world of data mining, algorithmic methods based on large digital datasets are routinely used for determining political influence and analyzing social dispositions or contagious trends. Digital transactions provide huge amounts of private and semi-private data on personal preferences that are harvested to customize and transform everyday experiences. A key nexus is provided by search engines, multi-purpose tools present in many dimensions of life, and the increasingly comprehensive environments of services offered by search engine providers. Understanding search-based societies does not only require an analysis of the deep history of the storing and indexing of information, but also the study of complex new forms of retrieval and data analysis. This includes the new position of search engines in a top-down control matrix as well as "bottom-up" recommendation systems, "push-search", folksonomies and the presumed wisdom of crowds. Search can only be understood if the still evolving redistribution of power in digital networks is addressed in both its centralizing and de-centralizing dimensions. 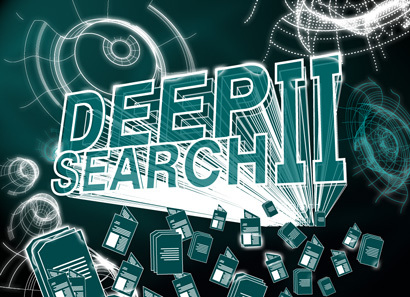 The conference Deep Search II focuses on key issues in this fast and dynamic field. First, we want to highlight the historical dimensions of our attempts to organize information and people. Second, we want to investigate the politics of search, conflict and dimensions of power, and, finally, future classification schemes beyond search, tracking and social recommendation systems, including new forms of pattern recognition in large data sets.